Where does one go to learn the fundamental aspects of high pressure synchrotron work from experts in the field? To provide this opportunity, from September 15-18, CDAC and HPCAT held a short course entitled "High Pressure Synchrotron Techniques," designed for graduate students and postdoctoral fellows that may be new to synchrotron work. 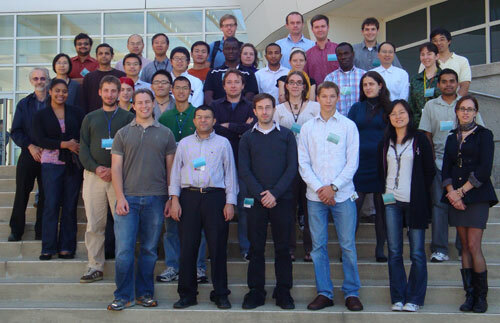 The goal of the Short Course program was to give an introduction to the fundamentals of high pressure science that are integral to the informed use of synchrotron facilities, but are not generally taught in university-level graduate programs. Fifteen lectures were presented by CDAC partners and HPCAT and APS staff, with the morning lectures focusing on the fundamentals of high pressure science, synchrotron radiation, high pressure chemistry and physics, thermodyamics, and electronic and magnetic properties. Afternoon sessions were devoted to applied aspects of various types of high pressure synchrotron experiments, including diffraction, spectroscopy, laser heating, imaging, and time-resolved measurements. Finally, the Saturday program included lectures on current topics: hydrogen storage, elasticity and rheology, and high-pressure mineralogy. 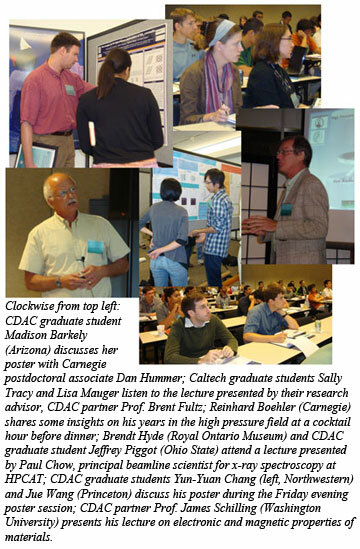 In all, 39 graduate students and postdoctoral fellows, both from within CDAC groups as well as other high pressure groups around the country, attended the lectures and participated in a poster session. The schedule for the course, along with .pdf copies of the presentations and poster abstracts, are posted on the website for the Short Course.